Quadrille #57 – Don’t rain on my parade! Hi dVerse Poets around the world! I’m Kim from Writing in North Norfolk and the bar is now open for the Quadrille, when we take any meaning of one word and transform it into 44 poetic words. Today is Victoria Day in Canada; next Monday is a Bank Holiday in the UK and Memorial Day in the USA. I just hope that we’re not rained on! Which is why I would like you all to write poems of exactly 44 words (not counting your title), including the word rain. The dictionary defines rain as the condensed moisture of the atmosphere falling visibly in separate drops. We can have rainfall, a rainstorm or a shower of rain, or even rainy seasons. 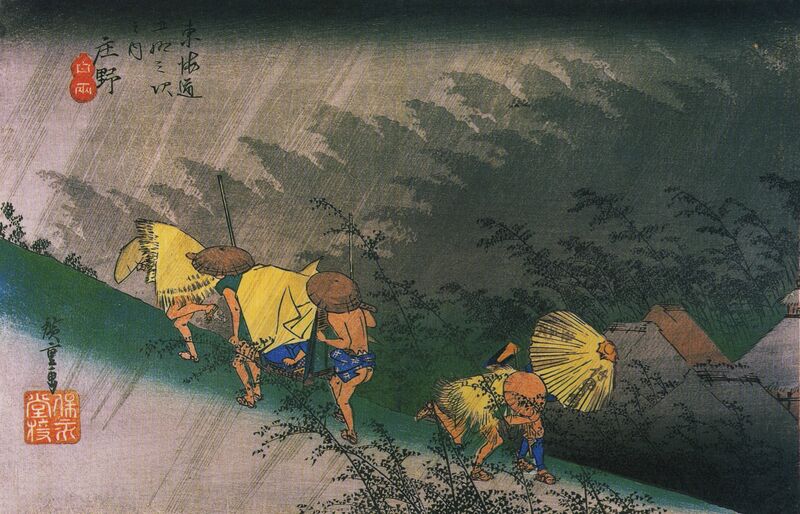 Rain can also be a heavy and continuous descent or inflicting of anything, such as a rain of blows or a rain of vituperation. 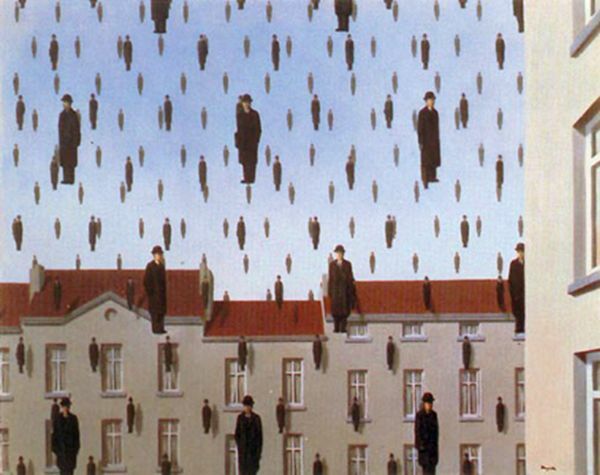 Rain can be a verb, for example, ‘It rained all night long’; ‘Tears rained from her eyes’; ‘It’s raining cats and dogs’. It can mean to send down in great quantities, as small pieces or objects, for example to rain confetti on a parade, or to offer, bestow, or give in great quantity, as in to rain favours upon a person. You can also rain on someone’s parade. Join us in writing rain-drenched poems in the hope that together we can magic up a big enough umbrella to keep the rain at bay this Monday! Just be sure your 44-word poem contains some form of the word rain. – Write a poem of exactly 44 words, including the word rain. – Put your poem on your blog and link back to this post. – Link it up to our Mr. Linky. – Visit other blogs. Enjoy some amazing poets. Comment. Come back later this week and write another one, and visit some more. Comment some more. Create as many poems as you please, including ones with all the words. A retired teacher, I am originally from London; lived in Cologne, Germany for nearly eight years, and the Republic of Ireland for two years, where I gave birth to my daughter. I have lived in North Norfolk in the UK for twenty three years. Reading and writing have been a huge part of my life since I was very young. I used to write mainly poetry, moved on to short stories, and finished my first novel for children aged 8+ at the beginning of this year: a ghost story set in London in the Second World War. I am currently writing a novel for older children, another ghost story, this time set in North Norfolk. I am an examiner and moderator for English and English Literature, and a volunteer at local libraries, leading Bounce and Rhyme for babies and toddlers, as well as a Chatterbooks reading group for older children. Contact with children keeps me young and alive. I can't wait to have grandchildren. Our two cats run wild in our overgrown garden that is also occasionally home to deer, hedgehogs, owls and dragonflies, and a huge variety of other birds and wildlife. I can see it all from my desk; it's peaceful, green and food for the imagination. Apart from being a huge Radio 4 fan, I love music, theatre and anything in the horror genre. Good evening, dVerse Poets! The bar is open and we’re ready to get soaked. The sun has been shining in the UK today, in fact it still is! Let’s enjoy some refreshing rainy day poems. The sun has just set here… no rain in sight, so I went into my nightmares to write. The North Norfolk coast isn’t that far from Stockholm as the crow flies – but it has to be a crow with lots of stamina! It takes a very strong crow. Lovely to see you back, Grace. Sounds wonderful… it must be great to see a new human growing. It’s a possibility. We have to wait until they move into their own home, which could be a while. I’ll be looking out for you! Hi Xenia! Rainy highlands – nothing better! Rain can mean so much… and it may even flood us. For me, rain makes me think of dancing. It makes me want to dance with it. Sorry I disappeared for a moment but I got waylaid. I’ll have to disappear again a little later to pick up my husband from the station. It’s lovely to see everyone on top form this evening. Thanks for hosting, Kim! Good word choice: rain. Thank you, Frank. All the poems I’ve read tonight have been fabulous. Haha, I used to love that Garbage song! I haven’t heard anything from Shirley Manson for years. I thought that whole first album was brilliant! I agree! That song ‘Vow’… Their second album was good too but didn’t live up to that first one. Great prompt- adding my link now. Thank you! Thank you for linking up, Linda! I like that – a hard rain around my brain! I’m just up myself and about to read all the wonderful rain Quadrilles. I hope you get some sleep! Good evening…there is rain on the horizon in my area. Hoping it waits until my son is done traveling home a few hours away. Then he is off to Finland. He’s been visiting me for awhile so I am raining a few tears today. Great prompt, Kim!! I know how you feel, Mish. I visited daughter and grandson on Sunday and didn’t want to come home. I shed a few tears all yesterday and this morning I’m reading about rain and tears! Thank you for joining us, Jo-Anne! Hello, and thanks for pouring prompts at the Pub this evening. I’m in, but will have to read later. In the meantime, I’ve been to bed and got up again! I’m always late with these. I’m taking a lunch break, but I’ll be back a bit later to read. It’s raining here again. UGH! I’m new to the bar scene, so this is my first post here. Lots of talent in the poems I’ve viewed so far. I think I’ll learn a lot. I’m glad I found you. We are glad you found us too, Maggie! I’m just about to do some more reading and commenting, and look forward to reading your poem. Pingback: Dog Weather | What Rhymes with Stanza? Pingback: Small rain – ….Bilocalalia…. 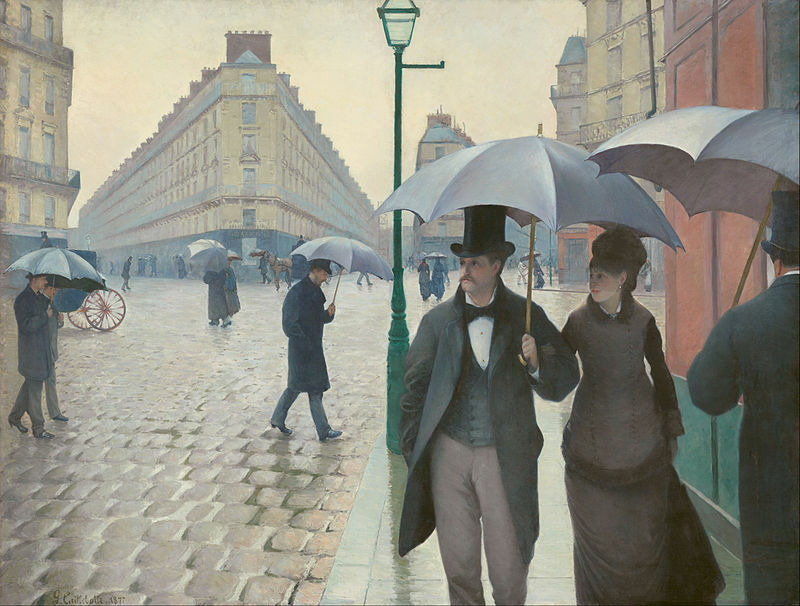 Hello Kim, your first painting on a Paris Street reminded me of a favourite painting by Renoir: “Les Parapluies” …. Oh yes! I love that painting too. There were quite a few to choose from, including that one.